I’ve been looking around for a new bike – a dedicated road bike. My TriCross has served me well transitioning from my MTB but 90% of my ride are all on the road where the versatility of the T’cross is lost. Between my two local bike shops I basically had my pick between any Specialized or Cannondale model along with a few other quality brands. This search started months ago, at first I was looking at something like a Roubaix or a carbon Synapse, perhaps with discs and even Di2. I can’t tell you how many times I went to the shops looking at and sitting on those bikes. I wanted to like them but they just never spoke to me, so I never even got them out of the shop for a test ride. I guess in my mind they really weren’t all that much different than my T’cross, at least geometry wise. Sure they frames were carbon but I didn’t feel it would be much of an upgrade. One of my favorite bikes of late has been the SuperSix Evo by Cannondale. The classic lines of that bike just makes me want to stare at it all day. I started looking at the range of models and for what I wanted it was really out of my budget. I was off the disc bandwagon (good since the SS Evo doesn’t have a disc model) but still wanted Di2 or at least a Di2 compatible frame. Unfortunately for me that only meant the Hi-Mod versions. So I started to look at the used market but did I really want to buy a used carbon bike from an unknown seller? All this time I had only been looking at carbon fiber framed bikes and really had not considered another aluminum frame. The TriCross is ok comfort wise but after 40-50 miles it begins to wear on you. Then I read a review on the CAAD10 which led me to research more and more reviews. I don’t think there was a bad review out there, many compared it to it’s big brother, the SuperSix Evo, some going so far that in a blindfold test they probably could not tell the difference in ride between the two. It seems the difference is on long rides, i.e. centuries the edge goes to the SSEvo, but very subtly with a smoother ride. The bonus is the frame is Di2 ready so it really checks all my boxes. With that information I set my search on finding a left over 2015 CAAD10. So yesterday I walked into my local shop and was talking with the staff and they all raved about the 10. They had only one left on the floor, in team colors but it was a 58, a little too big. I commented on how I loved that color combo and the salesperson asked what size I was, I told him I was riding a 52 now so he said he would check the storage in the basement to see if any were left. A few minutes later he came up, not only with a size 52 but in team colors no less – it was like finding a needle in a haystack! He threw some pedals on it and I took it outside for a few spins around their large parking lot. It fit me like a glove. Even with an eyeballed saddle height, jeans and flat pedals I felt right at home on it. It really changed my mind on what an aluminum frame can feel like. Even with the great discounted price I wasn’t really prepared to buy a bike that day (who would have thought they would still have something like that lying around?) I left the shop sans bike but the shop was holding it for me for a few days. I really wanted to discuss the purchase with my fiance first before bringing home a new bike. Well I got the green light in almost a “why didn’t you get it?” kind of way, so this morning I went back with pedals and my kit to take that baby for a test ride to make sure it was going to work for me. The salesperson was excited to see me again and had the pedals put on while I changed. Then out the door I went for about an hour ride. This CAAD10 is spec’d with mid-compact (52/36) cranks and a 11-28 cassette so I was a little worried about it on the hills as I’m currently used to a compact (50/34) with a 12-30 rear. There is a decent hill right out of the shop and after I got to the top, I turned around went down and went up it again! I’m not going to say it was easy and by the time I hit the top I was in the 36-28 combo but it wasn’t excruciating. That’s why I did it a second time to validate my results. I think for any longer climbs I still may want at least a 30 but that’s an easy change later on. After that I just put the bike through it’s paces, some rough roads, some hammering, rollers and a variety of other situations. All I can say is this bike wants to go fast. The handling is superb and when you scooch forward on the saddle, get low and lay down the power it just wants to go, go go! I honestly didn’t want to stop after an hour, but without any way to hydrate I reluctantly took it back to the shop. Oh and let me tell you the 11 speed Ultegra 6800 shifts like butter. So smooth and crisp. And here I thought my 105 5700 shifted nice but there is no comparison. With shifting like this I don’t know if I’ll ever even bother upgrading to Di2 – it’s seriously that good. As I got changed they gave it a once over, made a few adjustments for me (lever reach, brakes, derailleurs) and then I packed it up and took it home where I promptly took off all the reflectors (still need to remove the dork disk), added my LED lights, saddle bag & Garmin mount. Still need to get a pair of my favorite Elite Cannibal cages (shop didn’t carry them) and also make an appt at the shop for a proper fit. I have to give big thanks to Mike and everyone at Outdoor Sports Center in Wilton, CT. They have always been super helpful, never any pressure and certainly cater to their customers. 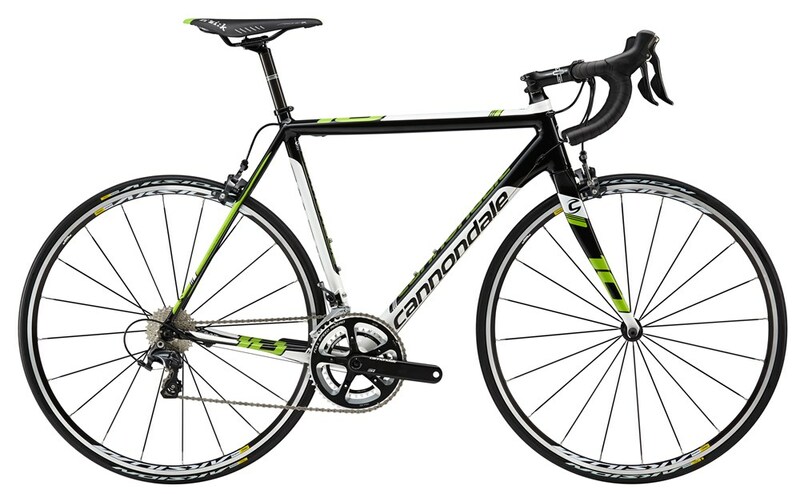 So without further ado here is my new baby a Cannondale CAAD10 Ultegra 3… well this is the stock photo, it’s too dark now to take a photo outside.